I am on a roll now, 2 more cards to add to the mix. 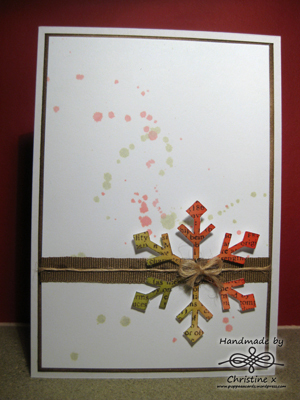 This card was inspired by a video for Hero Arts, created by Shari Carrol. This video is amazing, it is what inspired me to buy my Silhouette in the first place. The technique is pretty simple, just cut out the snowflake using the Silhouette Cameo, then blend Barn Door and Peeled Paint Distress inks over it. The text is from the Friends Definition stamp from Hero Arts stamped in Walnut Stain Distress ink. I used the Distress inks to create the splatter across the page by smooshing them on my craft surface, adding water and tapping a paint brush into this, then onto the page . I added a brown ribbon then some twine. There is a heart-shaped button in the centre of the snowflake but you can’t see it in the photo due to the bow. In order to get the matt to match the card perfectly I distressed it with Walnut Stain ink. 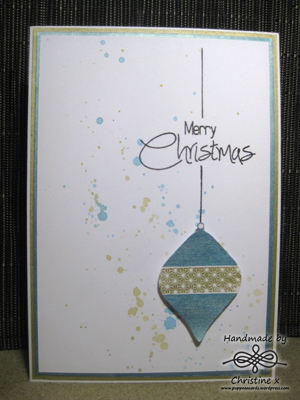 Here I used Metallic Promarkers which are water soluble to ink my stamp (from Clearly Besotted’s Signature Christmas set) then created the splatter across the card in the same way as before. The sentiment is from the same stamp set.